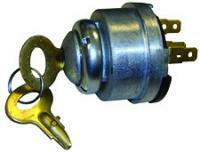 Oliver Part #: K7354B, 100423ASA, 105232AS, 611064AS, 721146A AND 20-7101027. Ignition Switch With 2 keys. Fit Oliver 55, 550, 660, 770, 880, 950, 1550, 1555, 1600, 1650, 1655, 1750, 1755, 1850, 1855, 1950, 1955, 2150 and 2255. Also Fits White 100, 140, 160, 2-70, 2-85, 2-88, 2-105, 2-110, 2-135, 2-150, 2-155, 2-180, 4-150, 4-175, 4-180, 4-2101 4-225 and 4-255. 5 Spade Terminals.